A health worker sprays disinfectant near a mosque, after the body of a man suspected of dying from the Ebola virus was washed inside before being berried in Bamako, Mali. It all started with a sick nurse, whose positive test results for Ebola came only after death. In a busy clinic that treats Bamako’s elite as well as wounded U.N. peacekeepers, who was the patient who had transmitted the virus? Soon hospital officials were taking a second look at the case of a 70-year-old man brought to the capital late at night from Guinea suffering from kidney failure. On Friday, Malian health authorities went to disinfect the mosque where the 70-year-old’s body was prepared for burial - nearly three weeks ago. Already some are criticizing the government for being too slow to react when health authorities had announced his death as a suspected Ebola case earlier in the week. BAMAKO, MALI (AP) — It all started with a sick nurse, whose positive test for Ebola came only after her death. In a busy clinic that treats Mali's elite as well as wounded U.N. peacekeepers, what patient transmitted the virus? Soon hospital officials were taking a second look at the case of a 70-year-old man who died after being brought to the capital late at night from Guinea suffering from kidney failure. A friend who visited him later died under suspicious circumstances, too. It wasn't renal disease, they then realized. The 70-year-old man had Ebola and all three of the relatives who brought him to the clinic that night had all since been admitted to an Ebola treatment center back home in Guinea. On Friday, Malian health authorities went to disinfect the mosque where the 70-year-old's body was prepared for burial — nearly three weeks ago. Already some are criticizing the Malian government for being too slow to react when health authorities had announced his death as a suspected Ebola case earlier in the week. "It's been 18 days since the Guinean man sick with Ebola died here. It's just too late," said Koumou Keita, his face full of worry. For nearly a year, Mali had been spared the virus now blamed for killing more than 5,000 people across West Africa despite the fact the country shared a porous land border with Guinea, the country where the epidemic first erupted. Now there are least three confirmed Ebola deaths, and two others suspected deaths in Mali's capital, Bamako. Residents here who have seen the horrific death tolls from Ebola in neighboring Guinea now fear the worst. "I feel uneasy because I have the impression that our authorities are not giving us the whole truth," said Ibrahim Traore, who works at a supermarket in the capital. "There are a lot of things not being said about how the Ebola virus came to Bamako." Health officials now must try to track down not only family and friends who visited the 70-year-old man at his hospital bed, but also the scores of people who prepared his body for burial and attended his funeral. 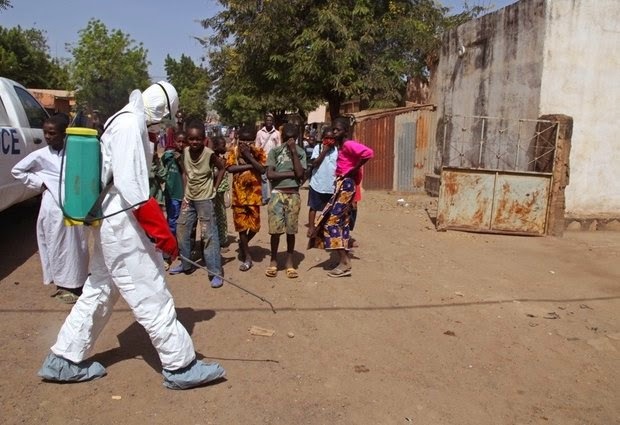 Teams of investigators are also headed to the border community where authorities believe the Patient Zero in the Bamako cluster — the 70-year-old man — first fell ill.
"The future of Ebola in Mali will depend on the quality of the surveillance of these contacts. If they are rigorously followed, and any subsequent cases are quickly identified and isolated, the battle will be won. But if there are failures in the process, it will lead to further contamination and further problems," said Ibrahima-Soce Fall, Mali's WHO representative. Among those placed under quarantine are about 20 members of the U.N. peacekeeping force who were treated for battlefield wounds at the Bamako hospital where the dead nurse had worked. The peacekeepers are based in the north of the country, where they are trying to stabilize a vast region where jihadists ruled until a French-led war in 2013. In recent years Mali already has suffered a separatist rebel insurgency, a coup that overthrew its longtime leader and a war against jihadists. Now Ebola threatens to be another source of misery if it is not contained. "Ebola could cause many deaths here in Mali, said Aminata Samake, who works at a bank in the capital. "We have a tradition of living closely together that could contribute to a huge contamination. Take the example of public transport — you find people crammed into a bus, one on top of the other. Large families share the same plates, even the same glasses for tea." Follow Baba Ahmed on Twitter at at https://twitter.com/Baba_A— .